All workshops take place at 3:30pm in Classics 21. Please contact the workshop coordinator (rosaliestoner@uchicago.edu) if you need an accommodation to attend this event. All events will take place at 3:30 pm in Classics 21. Please contact the workshop coordinator (rosaliestoner@uchicago.edu) if you need an accommodation to attend this event. All events will be held at 3:30pm in Classics 21. Please direct questions to rosaliestoner@uchicago.edu. *All meetings will take place at 3:30pm in Classics 21 and will be followed by a reception. 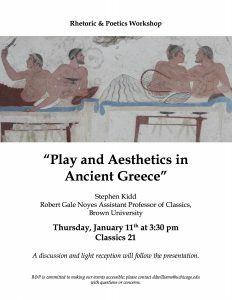 All meetings will take place on Thursday at 3:30pm in Classics 21 and will be followed by a reception.